The breadth of tread is any part of the tyre that can contact the road under normal driving conditions measured at 90° to the peripheral line of the tread. In simple terms, this is any part of the tyre that contacts the road under normal driving conditions. The tread pattern is a combination of plain surfaces and grooves extending across the breadth of tread and around the circumference of the tyre. This excludes any features designed to wear out substantially before the rest of the pattern. But how do you establish which features are designed to wear out considerably before the rest of the pattern? When you assess the grooves to which the legal minimum tread depth requirements apply, you must establish which grooves are the primary tread grooves. The primary grooves of any tyre are those grooves that contain the tread wear indicators (TWIs) or those that were originally moulded to the same depth as them.. Evidence of TWIs can usually be seen in those grooves designed to have them and their position is normally marked on the sidewall of the tyre at the shoulder of the tread. Generally, TWI’s are marked with a small arrow or ‘TWI’, however some manufacturers use their own specific markings. These grooves are not of equal depth to those with TWI’s and are designed to wear out before the primary grooves. When you assess the central three-quarters of any tyre, remember that the breadth of tread includes plain surfaces and any grooves. When you assess the minimum tread depth requirements, you only need to measure the primary grooves, those grooves that contain the TWIs or those that were originally moulded to the same depth as them. You might find secondary grooves within the central three-quarters, and they may be below the required minimum tread depth requirements. Even if this is the case, provided the primary grooves meet the minimum depth requirements, the tyre is acceptable for this part of the inspection. 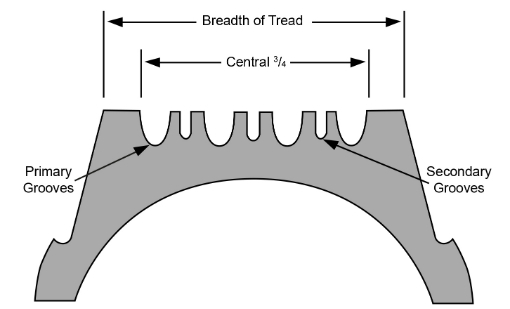 The tread pattern outside of the central ¾ of the breadth of tread can be bald. There is only a requirement for the primary grooves to meet the minimum tread depth. However, in this case the 1.0mm applies to any ¾ of the breadth of tread which is continuous around the entire circumference of the tyre. Additionally, no part of the primary grooves outside of the measured ¾ breadth of tread can be bald. Further information can be found in section 4.1 of the MOT inspection manual.